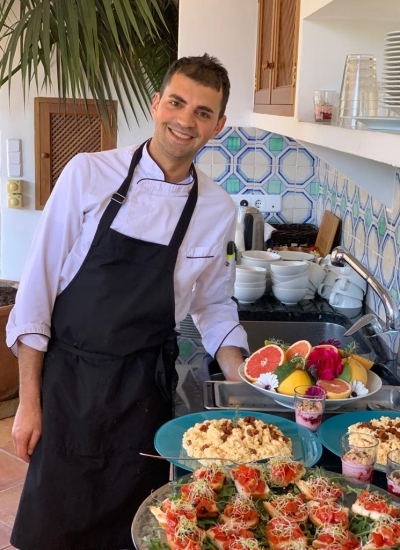 Our 4 day (3 nights) holistic yoga and healthy living retreat combines yoga practice twice a day, a beautiful hike, a 60 mins massage for each guest, and a cooking class by chef Francesco Colucci. All meals will be based on fresh seasonal produce, much of it sourced directly from our organic fruit and vegetable garden. Come, disconnect, and relax in total peace and beautiful nature as you deepen your practice. Maximum group size is 14. I have been found in kitchens across the globe over the past 20 years. Cooking is not a job but it is my passion. My extensive travel has taken me to many kitchens around the world. The knowledge and experience I have gained of many different cuisines, inspires me to create new taste sensations and push the boundaries. Fresh, local produce and ingredients, along with high quality service is what you can expect. €1000 (including VAT) per person for shared accommodation based on double occupancy. Bring a friend or make a friend! €1350 (including VAT) per person for private accommodation.